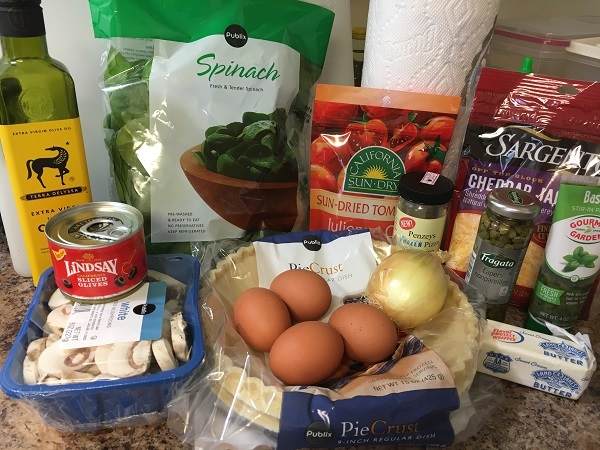 A Meatless Monday Quiche – Marie, Let's Eat! As our regular readers know, we have been doing Meatless Mondays for a while now, and I’ve been looking around for some options that might potentially interest my veggie-phobic son so he will participate a little better. While I love salads, when I make those I wind up creating a plate for the boy with hard boiled egg whites, a few wedges of cucumber and avocado, and a PB&J as his “salad” because I’m not heartless enough to make him eat a whole bowl of just plant matter with some eggs on top. Yet. I’ll be brave one of these days. Anyway, it occurred to me that since he loves scrambled eggs, and I already had about half the ingredients for a quiche in my fridge already, I’d pick up the other half and see what happened. So while I was roaming about on the web, dodging allrecipes and pillsbury.com and the like, I stumbled across a food blog that I’m putting into my list to read more. Actually, what sold me on this particular recipe is a comment the author made about the ingredients. She mentioned that her husband is a “reluctant olive eater” but that she loves them; well, in our house that’s reversed. 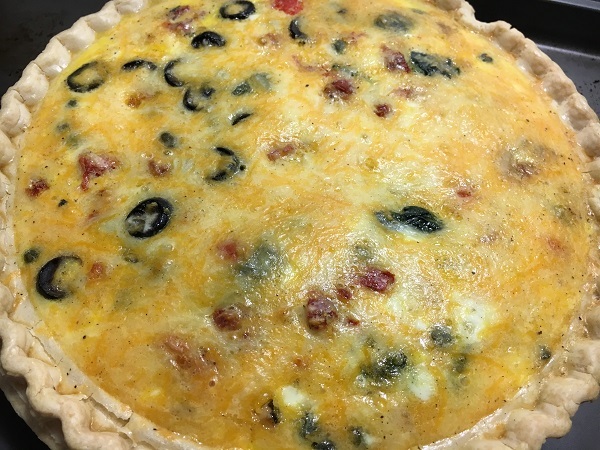 She reported that her husband was able to eat the quiche without a problem, so that made the deal for me. I had a can of black olives to use up gathering dust in the pantry, and a recipe to use them in now! Spoiler – the green stuff still repulsed our boy, but he choked down a small piece without dying, so I’ll count that as a success. I didn’t really notice the olives, which in my case is also a success, but then I’d kind of emphasized putting them on one half and there were just a few strays in my slice. Anyway, it was delightful. I got the inspiration from a blog post, but made a number of changes. 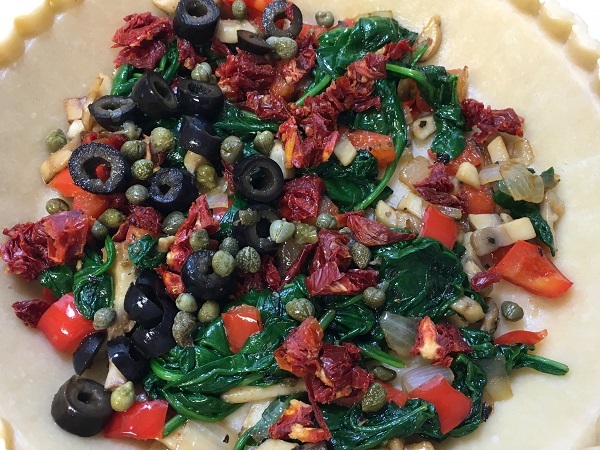 As usual, here is the original recipe, from https://wholefully.com/veggie-mediterranean-quiche/ , with my changes in parentheses! Preheat oven to 375. Chop up the sundried tomatoes and rehydrate in boiling water if necessary. Melt the butter in a pan and saute the diced onion until it is partly translucent. 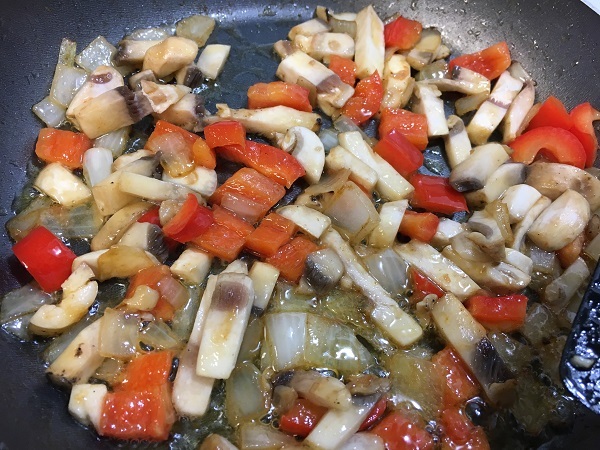 Add the garlic, peppers and mushrooms. When they have begun to soften, add the herbs or seasoning, then wilt the spinach over the mixture. Slide the contents of the pan into the prepared pie crust, breaking up any clumps. Place the chopped tomatoes and olives over the hot ingredients. Break the eggs into a large bowl and add the milk and half the cheese. Leave out some of the milk if you’re using a lot of ingredients, or you’ll overfill your crust. Pour this over the veggie mixture. Don’t overfill. Sprinkle the top with the remaining cheddar cheese. Bake for 50 minutes or until crust is golden brown and the eggs are set. Don’t overbake. Let cool 10-15 minutes before serving. Enjoy! Note: the original recipe cautions that with the cheeses and the olives there is a fair amount of salt already in the ingredients, so be sparing with any additional salt. I used barely a pinch and found it more than adequate. Posted on June 5, 2017 by Grant G.Posted in marie writes, our kitchen, vegetarianTagged cooking, marie writes, our kitchen, vegetarian.